Station Casino’s $690 million renovations of The Palms is set to get the party started on Thursday, April 4th with the opening of its breath-taking new venue KAOS. This multi-level day club is ingeniously linked with the nightclub by means of a massive glass wall, which retracts as a grand welcome gesture to guests; state-of-the-art audio, video and lighting technology; an amazing artist line-up, and a rotating DJ booth that puts a new spin on the Vegas Party experience. KAOS is a wondrous, new entertainment venue comprised of a 73,000 square foot Dayclub (designed by Friedmutter Group LV) and a 29,000 square foot Nightclub (designed by Rockwell Group), making it the largest day/nightclub venue in the world at 102,000 square feet; completely redefining the day-life and nightlife experience in Las Vegas. This multi-level day/nightclub integrates the use of a massive glass door dividing indoor and outdoor spaces, a DJ booth that rotates 360-degrees to accommodate the indoor and outdoor crowds, and a supplemental dome cover that will make KAOS a year-round destination. The nightclub features the 360-degree DJ booth as well as astonishing state-of-the-art technology to enhance each and every performance. 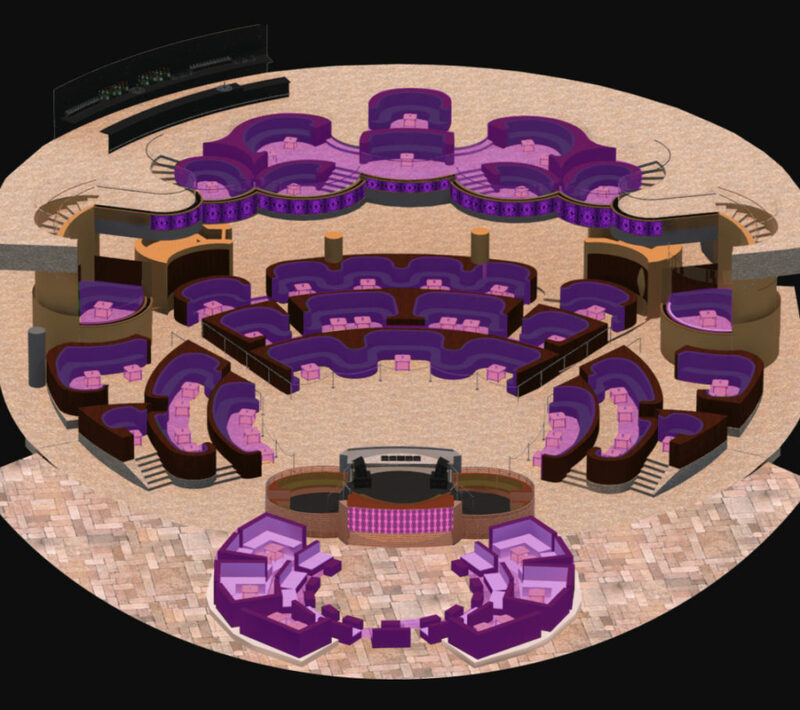 Guests will find themselves in the amphitheater-style nightclub, inspired by a modern playhouse, with art and architecture cohesively working together to create a mind-blowing experience. When you walk into the nightclub portion of the venue, your jaw will drop as you find yourself standing in a theater/spaceship hybrid. The various LED screens covering the front and sides of the nightclub bleed psychedelic, bright lights onto the dance floor and the ultramodern audio system envelope your being and draws your body to the dancefloor. The venue’s theater-like layout allows for clear views of the DJ Booth from almost anywhere in the club. At the day club, you can take a dip in any of the two main pools (one of which has a looming “Headless Demon” sculpture by British contemporary artist, Damien Hirst) or in any of the private pools inside the 39 cabanas. 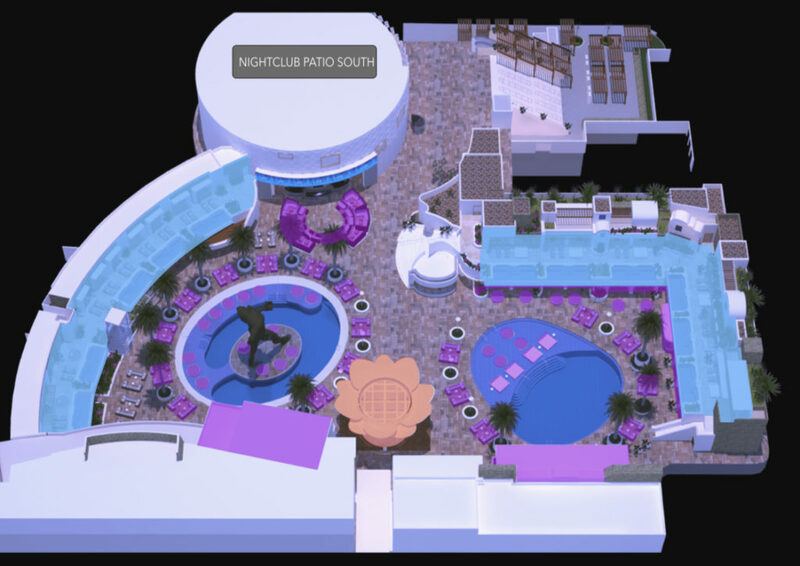 While the nightclub’s DJ booth can rotate to entertain the indoor and outdoor crowds, the day club has its own separate entertainment stage in order to provide for multiple performance locations. 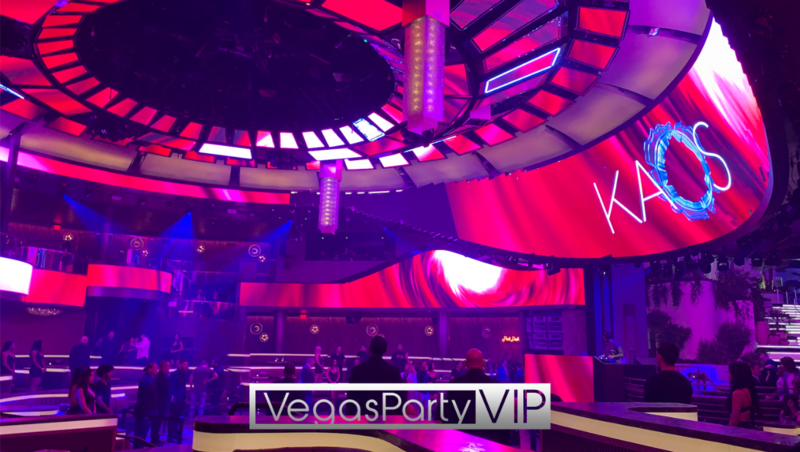 The day club section of the venue also includes an additional stage and Vegas’s largest LED screen (located on the eastern side of the Palms’ “Ivory Tower”), streaming live shots of the club to attract Vegas visitors to the venue. KAOS will have performances by musical artists spanning hip hop, EDM and Latin genres. Some of the venue’s exclusive residencies with world-renowned musical artists include: Above & Beyond, Armin van Buuren, Bad Bunny, Breathe Carolina, Brooks, Cardi B, Cheat Codes, Deadmau5, Eric Prydz, G-EAZY, Gorgon City, Jauz, J-Balvin, Kaskade, Louis The Child, Marshmello, DJ Politik, Skrillex, Slushii, Southside, and Vice. Every performance at KAOS is particular to each artist with next-level production and unique technology. Contact us for more information on KAOS Nightclub Entry & Bottle Service. Cover charge is subject to change on holiday & special event nights. KAOS reserves all rights. Upscale and Trendy, Men must wear fashionable, collared/button-up shirt.